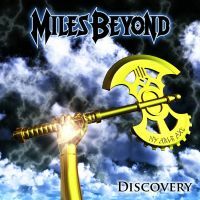 A few years back I reviewed the debut album from Miles Beyond, a traditionally-inspired Power Metal band from Flint, Michigan (read the review right here). I likened their sound to a mix of Iron Maiden and Iced Earth, a high-energy onslaught of epic dual-guitar harmonies and soaring vocals. With that album, Miles Beyond instantly became one of my personal favorite NWOBHM-influenced bands. And then there was silence... Actually, the band continued to battle in the trenches, gigging frequently, but my craving for new Miles Beyond music went unfulfilled - until now. The EP Discovery is the band's latest release, containing three songs to hold over rabid fans until their next full-length hits the streets. On their self-titled debut, Miles Beyond struck gold with their brand of classic Power Metal and they continue to mine that vein on Discovery. Their sound, as well as their songwriting style, remains deeply rooted in the Iron Maiden tradition. Frontman Tim Moody's vocals dive and soar very much like Bruce Dickinson's, but Tim not only excels behind the mic - he shares guitar duties with Paul Owsinski. Their harmonized riffs and leads are Miles Beyond's bread and butter, with the two axemen relentlessly belting out riff after infectious riff. The EP starts off with the title track, a rollicking song rife with sing-along choruses and high-energy riffs. The choruses are so infectious due largely to Moody's ability to vocally harmonize so well with his (and Owsinski's) leads, a trait that really sets Miles Beyond apart. "My Able Axe" brings bass player Larry Moody to the forefront, opening with an atmospheric lead under which he delivers a temperamental groove. While the riffs are a bit more urgent on this track than the lead-off song, Larry's bass contributions are very distinct and enjoyable. The band's penchant for epicness comes through on the final track, which opens with a majestic martial beat coupled with a bit of orchestration and an anthemic lead. Once again, a crisp riff drives the song and implants itself firmly in your brain. Solos run rampant on this track as well, with Larry's bass happily rumbling along underneath all the while, making this track an ideal hit for those six-string aficionados out there. To put it simply, if you're a fan of Iron Maiden (and who isn't?) you will without a doubt be a fan of Miles Beyond. They dish out their Heavy Metal the way that Heavy Metal is meant to be played - high-energy, focused, and classy. The only gripe I have with Discovery is that it's too damn short! Twenty minutes of Miles Beyond is like taking a sip of an ice-cold beer, then handing over the bottle. Thankfully, the band's next full-length is in the works. Until then, check out their EP (and debut album if you haven't already done so) and treat yourself to some excellent true Heavy Metal.